So… this past week on February 4th, was Chinese New Year (or Lunar New Year as some of you may call it). In the midst of my week which admittedly was not so bad in terms of exams and classes, we decided to get together at my place and have some great food and watch some TV and movies. We had a great time and watched a movie called 200 Pound Beauty. It’s basically a story about a very obese woman who sings very well and falls in love with her producer. She basically is the voice behind an actual idol who performs and can’t sing. And then she gets inspired to lose weight, and well… I don’t want to spoil it for you, so just go out and see it. You can check out some info about that here. 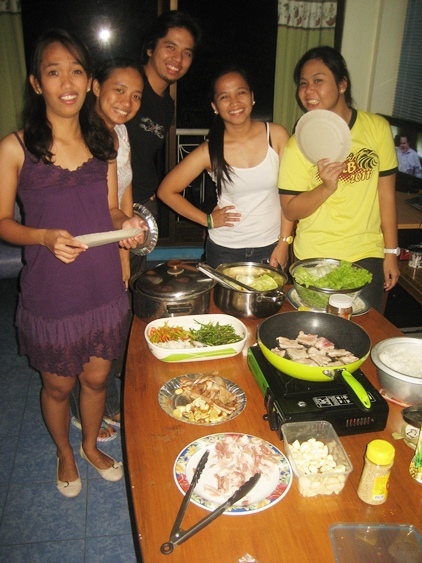 Here’s a picture of my vet rotationmates about to dig into the food we’ve all prepared. 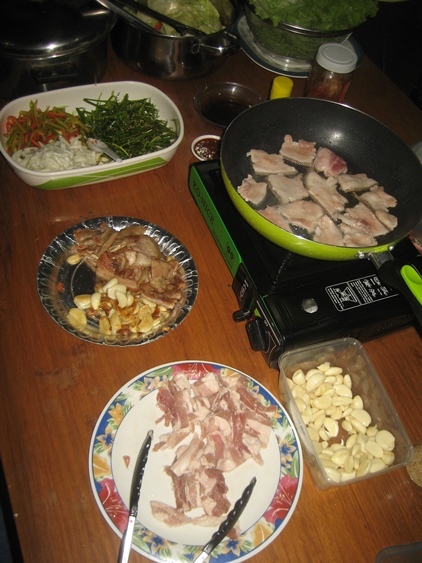 I made some samgyupsal (unmarinated pork belly sliced almost like canadian bacon that is simply grilled). Alongside that I made some green onion salad with sesame oil, salt and pepper. This weekend I headed to Manila–mainly in Taguig (For Bonifacio) and Makati City. 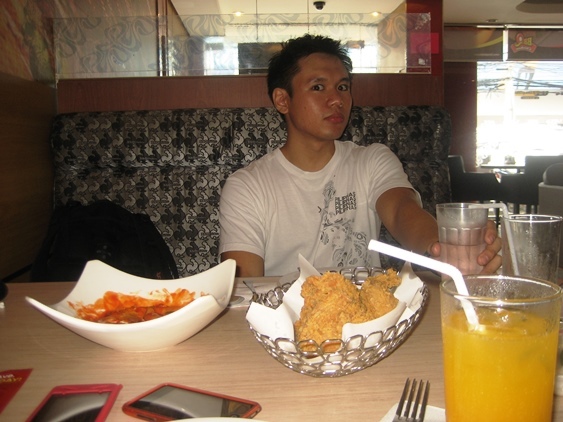 I met up with my friend Kamille and we headed around to find some of those small little Korean markets and other stores along P. Burgos Street and near Jupiter Street. I would’ve never imagined that there were Korean stores around the area, but thanks to Kam we found them! 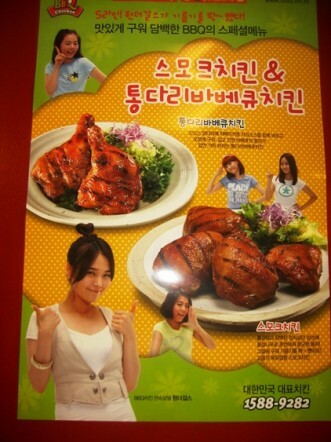 Kam eventually took me to BBQ Chicken, which is a Korean BBQ Chicken restaurant which is endorsed by the Wonder Girls (and if you didn’t already know this about me, I’m a HUGE fan of them). This is SunYe, the leader of the Wonder Girls, giving the thumbs up along with a few of the other members. If SunYe gives it a thumbs up it must be good! 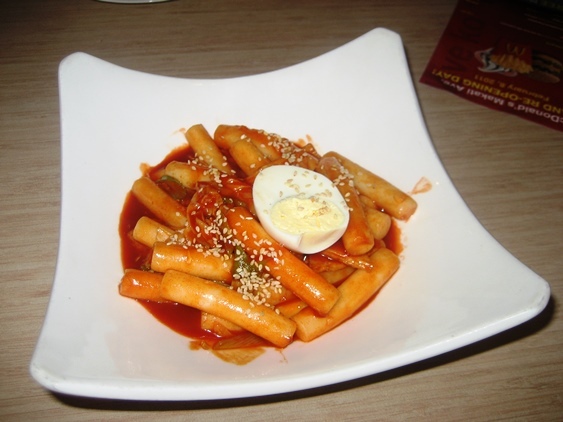 Had some ddeokbokki as well, which is a snack meal that’s popular in Korea. I’ve had this before in Singapore, but it was good to see how a Korean BBQ place handled it. It was extremely spicy, but I was willing to endure it since it was so good! I really enjoyed it, although I was sweating a lot and drinking all the water the restaurant gave me. I actually picked up the ingredients to make this at a local market, so I will be making this soon. 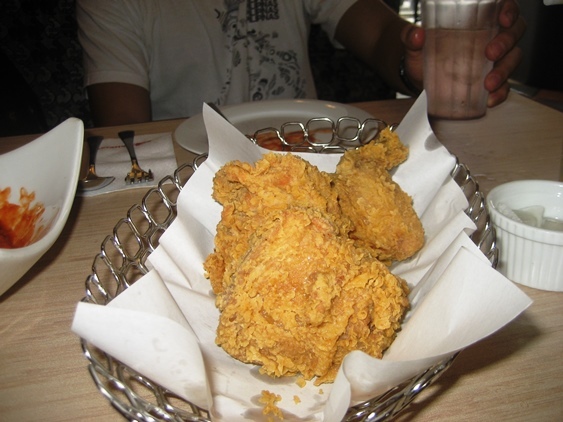 Also got to try their famous fried chicken. I actually wanted to order more, but Kam and I had a lot to eat that day… we had already gone to a Japanese place for lunch and then got some Korean ice cream at the local markets around Makati. By the time we went to this place I was kinda stuffed. But I guess that just means I’ll have to come back again. 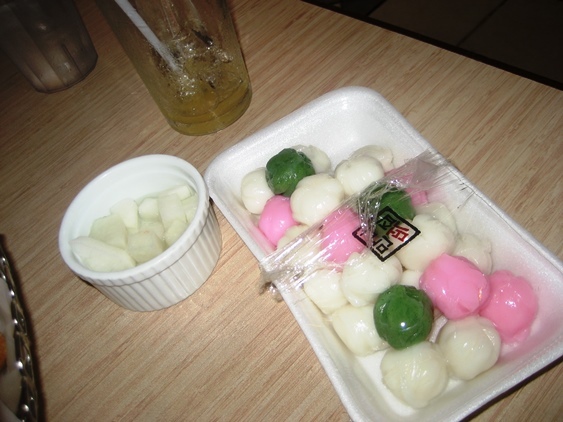 We ended the meal with some rice cakes that Kam had bought at one of the local Korean markets we visited that day. These were yummy and even had a little burst of juicy flavor inside. A good end to a good meal. Rice cakes with a semisweet flavor to them. Pretty good ending to our meal. I really wanted to eat more, but I couldn’t. These last few months I’ve found that my appetite has been decreasing a bit, or that I just can’t eat as much during one sitting. Thanks to Kam for the meal but I was totally stuffed! And also, we did have a lot of food previously so we decided to head to our next stop: The Myth of the Human Body exhibit in Taguig. We weren’t allowed to take pictures there, but here’s some info for those of you near the area who wants to visit it. The exhibit was pretty interesting. I had been to two similar exhibits in the last few years, in NY and Philadelphia, but this was one of the nicest ones. This was actually an exhibit from South Korea and will be in Taguig until April and it only costs 350Php per ticket, which is much less expensive than the ones in America. I highly recommend going there if you have the time. I then headed to the Fort where I had to say good-bye to Kam. I then hung out and had some drinks with friends at a few bars. Now I’m home and trying to rest up. I have to assist in an ovariohysterectomy of our goat tomorrow, so I need to read up and get some sleep. I hope you had a great weekend guys. I sure did!